Verizon's new corporate structure went into effect this week. Dubbed "Verizon 2.0," the restructuring essentially replaces the aging wireless/wireline corporate division within Verizon with a new consumer/business split that essentially allows the operator to bundle all of its products together into packages aimed at either regular consumers or business users and enterprises. For example, a top Verizon executive said one of the first things the operator will do under the new structure is to combine its wireless and wireline loyalty programs into one single program. While it's clear the new structure has serious implications for just about all of Verizon's roughly 144,500 employees, nowhere are the changes more apparent than in Verizon's network organization. Gone are the days when the company's network efforts stretch across different types of access technologies, like wireless and wireline. Now, Verizon is mashing it all together. So what does Verizon's network team look like? Here are some of Verizon CTO Kyle Malady's direct reports. To be clear, this isn't a comprehensive organizational chart. 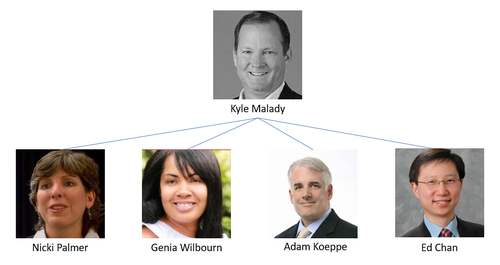 Instead, it's a look at some, but not all, of CTO Kyle Malady's direct reports. Nonetheless, these are some of the top executives calling the shots in Verizon's network division -- a critical job considering Verizon is on track to spent up to $18 billion in capital expenses in 2019. Malady essentially took over the CTO spot from Verizon's Hans Vestberg, who replaced outgoing CEO Verizon Lowell McAdam last year after initially joining Verizon in 2017. Vestberg moved to Verizon after helming Swedish equipment giant Ericsson for six years. Malady is a longtime Verizon tech executive who now has oversight not only of Verizon's wireless and wireline networks -- including the company's 5G buildout -- but also Verizon's customer and employee systems including its IT operations (which Verizon recently outsourced to India-based Infosys). Reporting directly to Malady are executives including Nicki Palmer, who was previously charged in part with building out Verizon's 5G network and now is responsible for network product development and 5G ecosystems, along with developing actual products -- like 5G Home and Verizon's Visible brand for millennials -- on top of the operator's network. Palmer also oversees Verizon's innovation labs. Ed Chan, another direct report to Malady, previously led national network planning and now leads Verizon's 5G engineering and performance operations, making sure the network is functioning. Adam Koeppe, meantime, leads Verizon's strategic tech evolution and capital planning for its wireless and wireline networks and IT infrastructure, including for the mobile edge computing platform Verizon has promised to launch later this year. And Genia Wilbourn, previously a Verizon VP in charge of wireline operations, is now SVP of Verizon's full network field operations teams, including for service delivery and assurance internationally. ● Sanyogita Shamsunder is now VP of 5G ecosystems and is in the network product development and 5G ecosystems area. 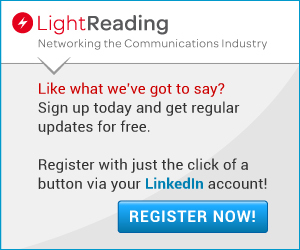 ● Mike Haberman remains VP of Verizon's network engineering, in charge of actually building the network. ● Bill Stone leads Verizon's core and RAN strategy and planning, virtualization, new tech deployment and spectrum strategy. ● And Srini Kalapala handles network tech planning, including for edge computing.